Having a quiet afternoon watching the tennis and creating my entry for week 197 of the Less is More Challenge - it's a ONE LAYER week with the theme of STARRY NIGHTS. 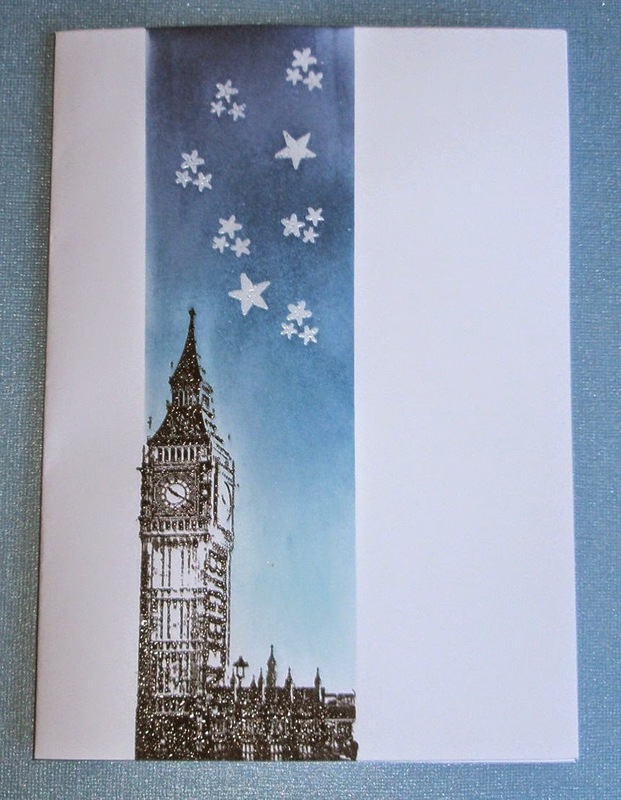 For this I've used the Big Ben image from Paperartsy HP1208 London set, inked with Onyx Black Versafine and clear embossed to enhance the black. The stars are small Hero Arts peg stamps clear embossed. I've just masked off the panel and blended over with Broken China, Faded Jeans and Chipped Sapphire to create the moody sky. Hope you like and thanks for popping by.......back to the tennis!! Brilliant card. I love your choice of image! Wonderful card Elaine! Love your Big Ben !! Fabulous one layer card, Love the masked background and gorgeous starry sky. What a fabulous Big Ben stamp you've used here. Love the starry night backdrop too. Glove London scenes (I've used St Paul's) this is gorgeous and the colours are just right. Wonderful card! Love that you used the Big Ben! This is a super scene Elaine, I love the gradation of colour in that sky; super inking!